Most of the time I cook pasta when I need to cook only for myself. Sometimes, Simply to satisfy my pasta craving, I cook simple pastas like tomato pasta, spinach pasta and pasta salad. 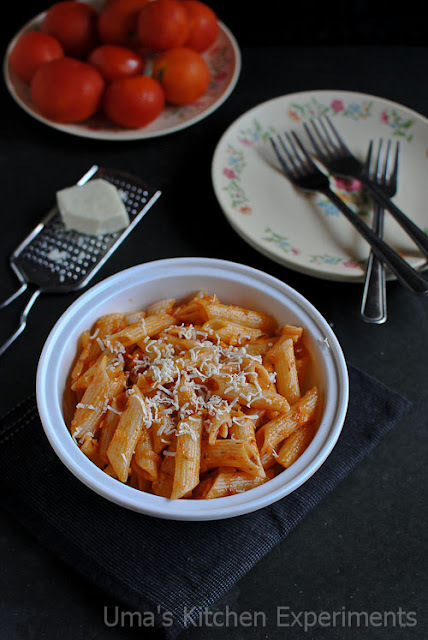 Though I have cooked this tomato pasta many times before, never clicked a picture of it. Once, I clicked the stepwise pictures but had no patience to click the final picture. 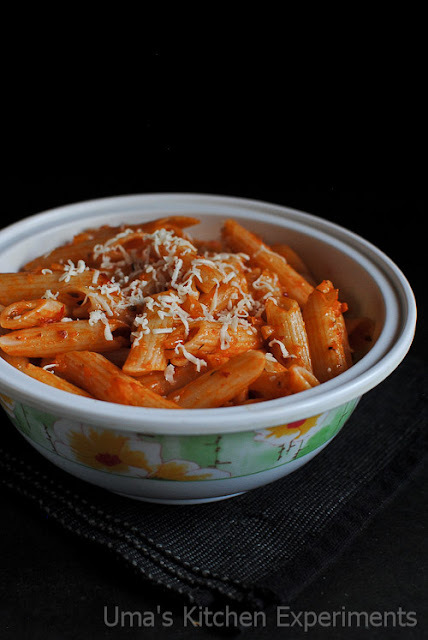 As many of you have requested me to post some pasta recipes here and for them, this time, I am managed to click pictures of both stepwise and final. At least from now onwards, I will try to update pasta section in my blog often. 1) Cook pasta as per the instructions given in the pack. I cooked it for 10 minutes by adding 3 cups of water, salt and a teaspoon of olive oil to it. Cooking time might vary based on the cooking method you choose (Stove top or microwave). 2) Once the pasta is cooked, drain the water and pass under the running water. Drain again and keep aside. 3) When the pasta is cooking, prepare the tomato sauce. In a pan, take a remaining cup of water and add tomatoes in it and heat it for 5 minutes. Turn it off and allow it to cool for a while and then peel the skin from the tomatoes. 4) Add this tomatoes to food processor / mixer and make a smooth paste of it without adding water. Keep it aside. 5) Take a pan and heat a tablespoon of Olive oil in it. 6) Add garlic and onion to it. Saute till they become soft and translucent. 7) Add paprika and tomato paste to it. Cook till the tomato paste becomes thick and the raw smell goes off. 8) Add oregano and thyme to it. Mix well. 9) Add cooked pasta and gently mix well. Add salt and pepper. Taste and adjust the spice level. 10) Serve hot with the topping of grated cheese. 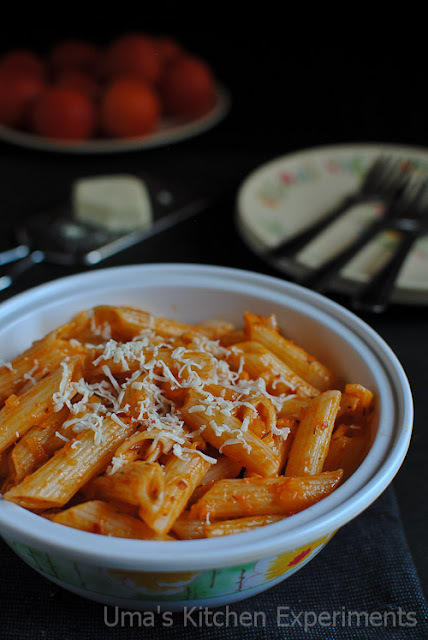 1) Use any type of pasta for making this tomato pasta. 2) If you prefer, you can also add tomato sauce/ketchup to it. 3) If you don't have paprika, Crush the dry red chillies and use it or simply skip it by increasing the black pepper powder. an all time fav pasta dish!!! Looking very inviting!! 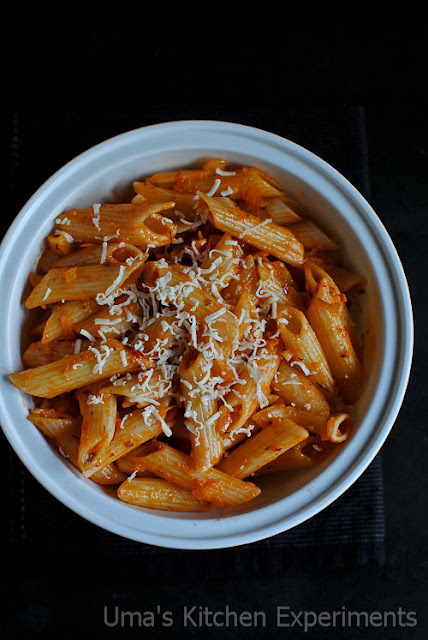 pasta looks delicious and yumm..
Looks yummy!! The tomato sauce is beautiful! All time favorite pasta dish. Perfect and well presented dear. Fresh sauce always tastes great with fresh herbs, very inviting! Like I keep saying, anything with tomato is fine with me. 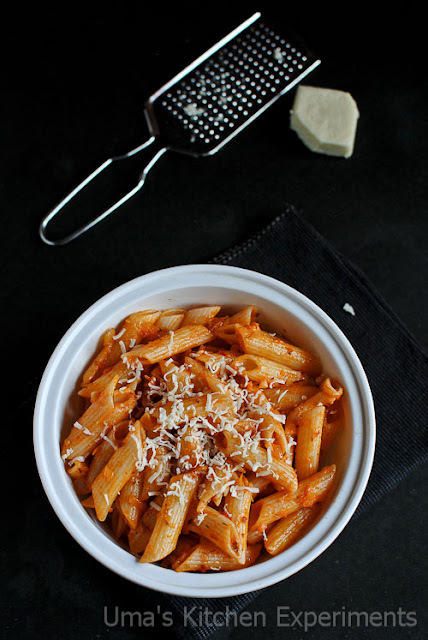 Lovely bowl,pasta are my family favourite and weakness too. Tomatoes does a lot of wonders to us. I prefer using the fresh ones that canned when I am making my pasta.